Torontonian John Murtaugh will venture out on a 2,500 mile (4,000 km) cycling adventure. Murtaugh celebrated his 70th birthday September 1, 2015. 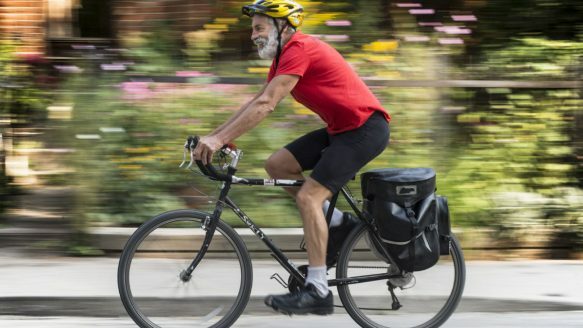 When most people envision how they’ll mark their 70th birthday, it usually doesn’t involve biking from Toronto to Mexico on a strenuous journey stretching for weeks. But most people aren’t John Murtaugh, 69, whose September jaunt is inspired by Ciclo — the story of two brothers who cycled from Mexico City to Toronto in 1956. Murtagh is following a rush of Canadians who have hit the lake or pavement to attempt cross-country marathons, strenuous bike tours and record-breaking swims. For many, the finish lines and records go unmet. They’re forced to give up their goals amid dangerous weather, unexpected injuries and the sheer exhaustion that comes with a trek filled with blood, sweat and tears. So what pushes others to still attempt these journeys? “The thrill,” said Murtaugh, who compared a cross-continental feat like his to other extreme achievements such as climbing Mount Kilimanjaro. I met with John Murtaugh, who was wearing a Biking Through Africa tee shirt, last night in San Miguel de Allende, Mexico, on the final night of his triumphant return to this favorite city, where he rode valiantly for 2,500 miles to raise $25,000 for a children’s charity started decades ago, by his late mother-in-law and wife, and is still diligently supported by his Canadian family today. Riding a road bike along highways stretching from Toronto, across the United States and halfway through Mexico, is, in anyone’s estimation, a long, hard, 44-day slog. But, it was blessed by a stretch of serene and lovely weather. A week later, that same territory is being soaked by torrential rainfall and flooding. And, we won’t even mention the specter of Category 5, Hurricane Patricia, which dematerialized in the face of Murtaugh’s noble approach. It just went away! I’ll give him that……but there’s still Mt. Kilimanjaro!